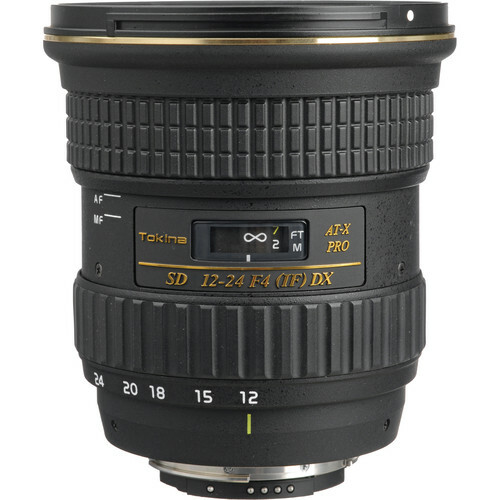 The Tokina 12-24mm f/4 AT-X 124 AF Pro DX lens is exclusively designed for use with Digital SLR cameras, and provides a super wide-angle zoom range, ideal for the tightest of interiors, as well as for dramatic landscape photography. This lens features the exclusive "Focus Clutch Mechanism", a signature of the Tokina PRO series lenses which provides a faster, smoother autofocus operation with a smooth manual focus action not normally found in autofocus lenses. Two Aspherical elements are incorporated in the lens design, to correct for spherical aberrations. It also incorporates internal focusing to prevent deterioration of the optical quality at close distances and to eliminate rotation of the front barrel during focusing. 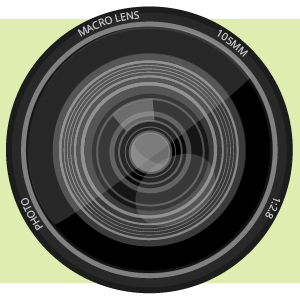 Note: Equivalent focal length in 35mm terms when used on a digital camera is 18-36mm. Note: DX lenses are NOT recommended for use with "full-frame" FX digital or 35mm film SLR cameras. AF not supported by D5000, D3100, D3000, D5100, D40 & D60 cameras. Box Dimensions (LxWxH) 6.6 x 5.1 x 5.5"
12-24mm f/4 AT-X 124 AF Pro DX Lens is rated 4.6 out of 5 by 226. Rated 3 out of 5 by I flash from Close down.....a lot. .... My new Tokina ATX 124 lens is much better but it is still unsharp on the right side of the image when enlarged at 100% in the computer. I have noticed that if I use a very small aperture (f/16 or smaller)the sharpness of this lens improves a lot and makes it a very sharp lens all around but...who shoots only at f/16 all the time !!! So, I may exchange it for the Nikon 12-24 f/4. No wonder the Nikon is twice as expensive...It has to be much better I'm sure. Otherwise, good construction, well built and easy to use. One other thing. F/4 at 12mm underexposes the image about 1/2 a stop when compared to F/4 at 24mm. I am very disappointed. Rated 5 out of 5 by Spartacus returns from Absolutely a fantastic lens Must have read 50 reviews comparing this lens to a number of comparable wide-angle zooms---weighing the negatives and positives etc. Forget it--just buy it--I have photographed several hundred images by now and can tell you that the minor quibbles about some softness here or there -some chromatic aberration here or there are overkill. This is a tremendous lens--sharp and extremely well built. For the price I doubt there is much better. Much better than expected--also together with the Nikon D90's improved available light sensitivity over the D40 which I traded up from-I find I hardly ever use my flash in available light situations--a huge artistic advantage. Rated 5 out of 5 by Tom L. from Great Value and Quality Ditto on all the positive reviews about this lens. It's outstanding and a lot of fun to shoot with. The quality(sharpness, color,etc.) combined with the price make it a winner over the Nikon version. When you buy one do yourself a favor and throw the lens cap in the closet and replace it with a Nikon 77mm lens cap(Mfr# 4750 B&H# NILC77). The Tokina cap kept popping out of my fingers while taking it on or off(a definite design flaw). Something the Nikon lens caps never do. Contrary to a previous review you will get lens flare even with the hood attached so be wary. I love this lens...great results. Rated 2 out of 5 by Anonymous from There must be a few bad ones out there I bought this lens after reading so many positive reviews that I thought I'd be making the purchase of a lifetime! My biggest issue is this insanely frustrating blurriness on the right side of all my images. I have tried shooting in all conditions and have been unable to get a single (acceptably) sharp image from edge to edge. There almost seems to be a perfect line where the sharpness drops off on the right side of all my images!! I agree with another reviewer in that it is difficult to obtain any acceptable clarity without a tripod and/or excellent light. And the CA is another problem--I do not want to have to 'correct' all my images in PP. I am trying to love this lens, but it's just not happening. Rated 4 out of 5 by LensGrampy from Great Lens for the price A nice lens, although a little heavy. When combined with a Speedlight and flash bracket it's quite a weight to carry around. I am especially pleased by the sharpness and contrast of the images produced, and the lack of vignetting and flare. The autofocus is extremely quick and quiet too. Chromatic abberation was noticeable on the widest setting but that was an exception (bare branched tree on the extreme right of the shot), so I wouldn't deduct too many marks off for that. I would advice the use of a filter, as the lens cap is extremely fiddly to attach and detach. Overall, a very capable lens, and one I will definitely use regularly. Rated 5 out of 5 by AlejoC from Excelent purchase! I'm very happy with my new Tokina 12-24, it is everything I expected. Its clear and sharp image has made me get very good comments about my pictures. With my Nikon d90 (purchased at B&H) works perfectly, at first I was a little worry about the F4, but I've had no problem with some ISO speeds under 800 on my D90. This lens's focus is very fast. It is perfect to catch beautiful skies, clouds, mountains, and bodys of water. If you can get closer to the subject you can get a nice perspective and angles when totally open. If you close to 24 mm, it is perfect to take nice portraits. Please do not buy a 77mm Tiffen filter for it since it is too thick, the lens's glass hits the filter. Hoya its expensive, but if you want to protect the lens, it is absolutly necessary.